Tubes feature an inner wall coated with spray-dried sodium heparin or lithium heparin. VACUETTE® tubes are manufactured from virtually unbreakable PET plastic. 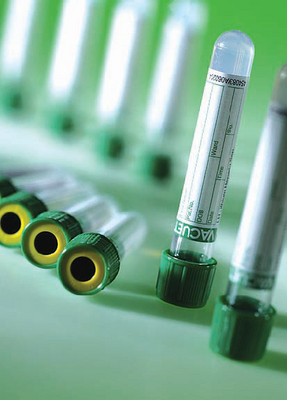 These clear tubes are supplied with green non-ridged pull caps that feature an exterior color-coded ring to indicate either the additive used or draw volume. A black ring indicates standard tubes, a yellow ring indicates the inclusion of a separation gel, and a white ring indicates a tube designed to accommodate pediatric draw. Tubes are also available with lithium heparin coating and a gel separator. The specific gravity of the gel lies between the blood cells and plasma so that, during centrifugation, the gel barrier moves to form a stable barrier separating plasma from cells. Plasma may then be aspirated directly from the collection tube, eliminating the need for transfer to another container.